As horrified as I was to learn I had been unwittingly sharing my coffee with my Chihuahua, I was also horrified that she was consuming caffeine. I never considered that she might find coffee appealing, so I never worried about keeping my coffee out of reach. During the holiday season, it’s important to keep a close eye on your pet. What they find appealing or appetizing may surprise you – and it could be very damaging to their health. If you have frequent guests or are planning holiday parties, you’ll have to be especially careful to make sure your dog or cat stays safe. Remind guests not to leave alcoholic beverages (or coffee!) sitting where your pet can get to it. Another big drinking hazard you may not have considered is the tree water. If you choose a real tree, be sure to cover the water and make sure the tree is secure so it can’t tip over. Also, don’t add preservatives, fertilizer, or aspirin to the water – just in case your pet finds a way to access it. Food can also be a hazard, especially during the holidays. Don’t give your pet turkey bones – these can splinter. Chocolate can make your dog or cat very sick – keep the sweets up off the tables. Raisins, macadamia nuts, persimmons, currants, and other typically “holiday” ingredients can be harmful or even fatal to your pet. Keep an eye on your guests and your pet. Guests, especially those without pets, may not realize that giving “just a bite” off their plate to your dog could cause serious injury. It might even be a good idea to keep your pet in another room during a party – this will keep him safe and will reduce his stress at being surrounded by so many new faces. Who doesn’t love holiday decorating? You may find that your pets are getting in on the act. 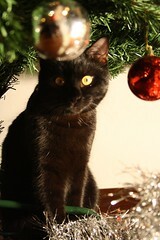 Cats love to bat at sparkly objects, so keep ornaments up high and out of reach. Be careful when selecting ornaments – glass orbs are pretty, but a few minutes of being batted around by your cat and these could break, leaving dangerous shards of glass on the floor. Try to choose ornaments that your cat won’t be attracted to — matte finishes and less vibrant colors won’t attract her attention as easily as something that sparkles, glitters, and dangles. Don’t use tinsel, ribbon, string, or fake snow in your decorating – all of these are dangerous if ingested. Some pets will “unwrap” gifts – make sure that anything your dog might choke on or be tempted to eat (certain small toys, chocolates, etc.) are put away and not left under the tree. If your pet likes to chew, keep electrical cords out of reach. Poinsettias aren’t quite as bad as their reputation. If your pet nibbles on one of these pretty holiday plants, they may have some “mild gastrointestinal irritation,” according to the ASPCA, but they’ll likely be just fine. Plants you do have to watch out for: mistletoe, holly, lilies, Christmas cactus, hemlock, and ivy. These can all cause serious health issues and some can even be fatal. The holiday season is a busy one and sometimes our pets can be overlooked in all of the festivities. Make sure you pay extra attention to your pet and keep his routine as close to normal as possible. And if you have a five-pound stealth coffee drinker lurking around, keep your mug with you. Always.